After 10 goals yesterday, it wasn’t the goals that troubled us today, despite the usual 5 goals crop. No, today, it was the Referees. The only Spanish referee in the tournament, Alberto Undiano Mallenco, decided he’s going to try and have another Portugal – Netherlands from 2006, and spent most of the match between Serbia and Germany flashing yellow cards (nine) and sending off Miroslav Klose for a second yellow, which was nothing but deserved. Serbia scored on it’s first attack after they gained the numbers advantage through Milan Jovanovic. Next, on to Mali’s Koman Coulibaly, arguably Africa’s best referee. He didn’t seem keen on the United States grabbing a win against Slovenia, and disallowed Maurice Edu’s rightful winner for no reason at all. It seemed that in all the 50-50 calls, he preferred to give the Slovenians the advantage. The United States weren’t very good in the second half and deserved to go down behind 0-2, but they deserved to get the equalizer and the winner in the second half. Finally, to Uzbekistan’s Ravshan Irmatov, Asia’s finest. He didn’t make any controversial call, but he just didn’t seem to want a flowing game between England and Algeria. It’s not that England were very good, and the 0-0 draw did justice to both teams, but every time an Algerian player fell to the grass, there was Irmatov with his whistle, keen on calling a foul against the English. Just let us watch some un-interrupted football, that’s all we ask. Oh, how quickly things change. Just a few days ago, Germany were the hottest team in the World Cup after their 4-0 demolition job against the Aussies. Now? The last 16 doesn’t seem like a sure thing. That’s how one bad referee and Lukas Podolski’s inability to score does to you. Milan Jovanovic and Milos Krasic were the only ones who played decently for the Serbs, who seemed to hang back and let a 10 man Germany keep them on their heels, and were lucky to come out as winners. Still, Low’s team needs to beat Ghana, not such a sure thing anymore. Serbia also need a win, against the apparent weaklings of the group. The best match of the day didn’t go without its own controversy, as Maurice Edu’s potential winner for the Americans was disallowed for no reason. The United States showed another bad start, lacking concentration, conceding an early goal again. Torres and Donovan tested Handanovic as the Americans certainly seemed to improve after Birsa’s opener, but a failed offside trap allowed Zlatan Ljubijankic to send the teams to the dressing rooms with Slovenia leading 2-0. Second half? Different story – The United States searched for goals, Slovenia welcomed the American comeback, and Landon Donovan’s early goal meant it would be a one-way street in the second half. It took them more than 30 minutes, but a fantastic combination found Michael Bradley in a comfortable space to make it 2-2. Slovenia still lead the group, and a draw against England will be enough for them, making an historic appearance in the next stage. The United States, facing Algeria, need a win, but if Slovenia beat England, would only need a draw to make it into the last 16. From the best game, we move on to the worst. England failed to get things going against the Algerians who played much better than in their performance against Slovenia, especially in the first half, when they kept pushing England back, hoping James would do another “Robert Green”. The game never really got going, as England failed again and again to make the Gerrard-Lampard-Barry trio work, and Wayne Rooney produced another very weak outing. Capello threw in two strikers and again that weird Phillips switch with Lennon, just as Lennon started to improve. Now England arrive to their final match needing a win, and from the looks of things tonight, their nerves aren’t up to it. * Germany and Serbia have played 2 matches, Ghana and Australia just one. Serbia – The Serbs won, and their defense looked good, while Krasic and Jovanovic had a nice game. Still, they didn’t impress – instead of going for the jugular against ten Germans, they stayed back and if it wasn’t for some good fortune, their World Cup dream would be over today. Maybe it’s the striker Antic needs to attend – there are none right now. 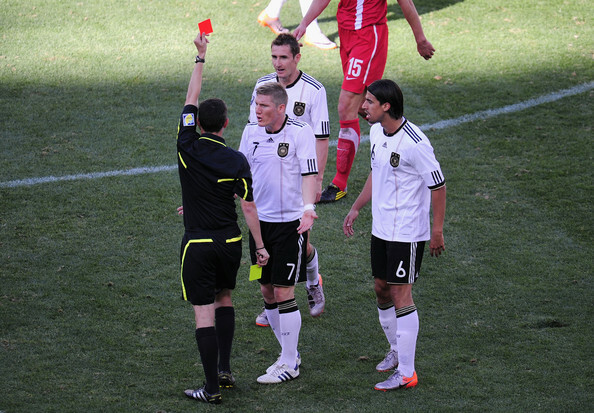 Germany – Like Spain against Switzerland, Germany played well, got the chances, but got screwed – this time by the ref. Low was right to say Germany will make it through, but it’s going to be much more complicated than predicted a few days ago. Still, Germany look good, just a bit more concentration in front of goal. Slovenia – Funny thing, how things turn out. After round in Group C, Slovenia only need to draw against England to make it through. They can also lose if the United States and Algeria finish in a draw. Slovenia have a strong defense, and if the English play as nervously and stupidly as today, might cause a huge upset. Problem is, the attack, despite scoring two against a weak American defense, won’t have it easy against England. United States – When Donovan started playing well, the US looked well. That’s all there is to it – the man sets the tone for the United States, but needs help in the middle to carry the load and dictate the pace. Maybe a more attack-minded approach from the get go could boast well for the United States against Algeria. England – So many things went wrong, and Capello, a rarity in his career, doesn’t seem to have the anwers. I think he needs to start playing Joe Cole on the flank, take out Heskey and let Gerrard play off Rooney. He can’t do a drastic change, but things aren’t working for England, and if they fail to qualify, the tabloids will have his head. 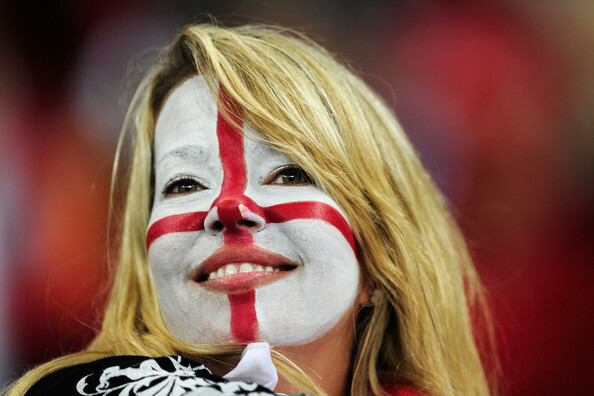 Algeria – Enjoyed the confused English state to control the match in the first half. If they’re not facing an aggressive and pressing side, Ziani & friends can play some nice football. The United States are a better team, but Algeria still have a chance, and they won’t be easy on giving up their qualification chances. The match for the top of the group. If Robben is healthy, no chance for the Japanese. Still, if he’s not, let Elia play on the wing, the Dutch look much better with speed on the flanks. Australia just don’t seem to have anyone who’ll score goals for them, and now Cahill is suspended. Hard to see Ghana losing this one, despite not playing a great game against Serbia. They have enough talent to beat the Aussies and repeat their 2006 success. Denmark didn’t look very good against the Netherlands, but if Eto’o is unhappy as the rumors say he is and Cameroon produce another flat showing like the one against Japan, Denmark have enough to beat the Africans. Last note – 43 Goals, 23 matches. We’re almost at 2 goals per match – looking much better.